India and the United Nations Industrial Development Organization (UNIDO) have joined hands to implement a $40 million pilot project for managing the country’s health care system effectively and dispose of hazardous medical waste. The project, which was signed between UNIDO and Ministry of Environment and Forests, would be implemented in states like Gujarat, Karnataka, Maharashtra, Orissa and Punjab, with M.S. Ramaiah Medical College (Bangalore) acting as the national implementation body, it said. It would benefit four large hospitals, eight medium-sized and 16 small ones in each state. The project, which would help in reducing persistent organic pollutants, comes within the broad framework of the Country Programme of Technical Cooperation between India and the UNIDO signed in May 2008. HCWH-Asia, along with Bali Fokus and the Swedish environmental agency KEMI, is working with the Denpasar municipality to encourage city hospitals to apply a sustainable non-mercury and medical waste-processing program. The municipality recently signed a memorandum of understanding with Bali Fokus and several hospitals to process their medical waste in a non-hazardous manner. The campaign started with 10 hospitals, including Sanglah General Hospital, Udayana Army Hospital, Bhayangkara Police Hospital, Puri Raharja Hospital, BaliMed Hospital, Indera Hospital, Surya Husada, Bali Royal Hospital, Wangaya, and Puri Bunda Hospital, all in Denpasar. While some hospitals and other medical facilities still use medical equipment containing mercury, the government had successfully reduced mercury usage in a number of hospitals. The environmental organizations worked hand-in-hand with governments and hospitals. Because of this interaction, more and more health care facilities have pledged to phase out mercury. This is the first initiative to phase-out mercury that the local government has engaged in. Bali Fokus and its counterparts in the program provide intensive training and guidance on the usage of personal protective equipment and standard procedures for managing mercury waste. With the wealth of support and information being passed around, the attitudes towards mercury in Bali are shifting. Best known for its spectacular scenery and ancient culture, Nepal is also starting to take serious action to tackle its medical waste and mercury problems. At the moment, most hospitals still use mercury thermometers and blood pressure meters, and medical waste is disposed of with municipal waste, where it can pose a risk to the general public and rag pickers. Health Care Without Harm members, the Health Care Foundation Nepal (HECAF) and Center For Public Health And Environmental Development (CEPHED) teamed up the second week of March 2010 to deliver a training on medical waste management for district health officials and nurses. HCWH strategic partner in India, Toxics Link, also shared their expertise, and other speakers come from the World Health Organization and Nepali hospitals. HECAF have already created Nepal’s first safe and sustainable medical waste management system at the National Kidney Centre and are in the process of replicating the system to other hospitals in the capital, Kathmandu, the second city, Pokhara, and in small clinics in various locations across the country. At the National Kidney Centre, the waste is segregated at source in the wards, according to the material it is made of, and whether it is potentially infectious. Next, the infectious waste is disinfected in a dedicated autoclave. Needles are cut off syringes before autoclaving. Recyclable materials are then sold to traders, and the income covers about 40% of the total waste disposal costs. The National Kidney Centre is also Nepal’s first mercury-free hospital, and both HECAF and CEPHED are keen to see the toxic metal completely phased out. HECAF is focusing on assisting its partner hospitals to phase out use in medical devices, whereas CEPHED are creating educational materials and working on outreach to all addressing all uses of mercury across the country. HCWH-Asia believes that it’s possible to do a national health campaign without spreading dangerous waste. Case in point: the Philippines Measles Eradication Campaign (PMEC). Immunization is vital to preventing disease and saving lives. However, large-scale vaccination programs can create enormous amounts of waste. Often, this waste is burned openly. Sometimes, donors build cheap, improvised incinerators, which are used to burn syringes and other waste materials. This activity dumps dioxins into the air, and negates any health advantage that the vaccination programs impart. In 2004, we collaborated with the Philippine Department of Health (DOH), in association with the World Health Organization (WHO), to demonstrate viable alternatives to burning waste. As a result, the Philippines became the first country to deal with waste from a nationwide vaccination program without resorting to incineration or open burning. The follow-up to PMEC targeted an estimated 18 million children during the month of February 2004. In a little over a month, the PMEC generated an estimated 19.5 million syringes, collected in 162,000 safety boxes, amounting to about 810,000 liters, or 130,000 kg, of sharps waste. Also produced were an additional 740,000 liters, or 72,000 kg, of non-hazardous waste such as empty vaccine vials and ampoules, and syringe wrappers. To learn more about the ground-breaking campaign, head over to the campaigns section. In 2005, HCWH-Asia conducted a Health Care Waste Assessment Project (HWAP) in four tertiary hospitals in Metro Manila. In 2006, the project was repeated in the province of Northern Samar. 2008 brought in more success. We partnered with the local government of Baguio City and seven tertiary hospitals to conduct another model of the Health Care Waste Assessment Project. The objectives of the project include documenting the good practices of the hospitals, and coming up with baseline data on the total medical waste being generated in each hospital. • Draw up baseline data on good health care waste management practices. • Identify the types of health care waste generated per hospital and the total volume of health care wastes generated by the facility/locality. • Draw up existing waste management systems and procedures with particular attention to good practices and problems encountered. • Determine the actual costs of existing waste management systems in the hospitals under study. • Develop a health care waste assessment procedure appropriate in the Philippine health care setting and also for adaptation in other Asian countries. The results and recommendations of the Health Care Waste Assessment Project will allow the health care facilities being studied to improve their waste processing systems. Hopefully, the highlighted good practices of a hospital/health care facility would serve as model to other hospitals in the region. By laying out these practices, we’re laying the groundwork for these institutions to adapt and integrate better procedures. Results of the Philippine study will further refine the suitable health care waste assessment processes for Asia. • Stage 1 is gathering of preliminary data, which include document review, interview with the hospital administrators and members of the waste management committee and preliminary walk-through in the hospital. • Stage 2 is a validation of preliminary data gathered from Stage 1 and further validation through focus group discussions. • Stage 3 is the final validation of data gathered from Stages 1 and 2 through actual walk-through assessments and observing the waste management practices from waste collection, waste segregation, actual weighing of health care wastes, transport and final disposal. • Stage 4 is the collation and analysis of data gathered from Stages 1 to 3. Collated data are analyzed and initial results are given in the form of case studies to all hospitals. Investing in polluting waste disposal systems can cause long-term damage to both the environment, and the economy. Take, for example the 26 medical waste incinerators that were purchased from Austria on a loan worth PHP 503,647,200 (or ATS 199,860,000). In 1995, the Philippine Department of Health (DOH) purchased the incinerators, with complete disregard to ongoing talks that would lead to the passing of the Clean Air Act in 1999. Dubbed "The Austrian project for the establishment of waste disposal facilities and upgrading of the medical equipment standard in DOH hospitals," the project's key component was the purchase of 26 medical waste incinerators called Multizons. The units were supplied to the DOH by VAMED, an Austrian company. And financed by a loan from Bank Austria Aktiengessellschaft. The incinerators were distributed to various DOH-controlled hospitals nationwide. After a couple of years, the machines failed to improve waste processing, and even attracted complaints from concerned groups. In 1999, the Philippine legislature passed the Clean Air Act, which banned the incineration of medical waste by 2003. The DOH, in cooperation with the WHO, subjected the incinerators to a comprehensive emission test, the results of which showed high emissions. In one incinerator tested, dioxin emissions were eight hundred seventy times the limit set by the Clean Air Act. The machines were shut down by the DOH in 2003, but the country will pay roughly US$2 million a year for the loan connected with the failed project. The last payment is due in 2014. In reaction to this, HCWH-Asia is leading the campaign to cancel the Austrian loan connected with the medical waste incinerators. See the report, Toxic Debt: The Onerous Austrian Legacy of Medical Waste in the Philippines. In December 2011, HCWH-Asia teamed up with Philippine EcoWaste Coalition and the international group Global Alliance for Incinerator Alternatives (GAIA) to raise alarms over pending proposals to open waste incinerators masquerading as waste-to-energy facilities. The teams visited local governments and communities, and warned the citizens on the toxic byproducts of these facilities. According to the 2007 report of the US EPA, carbon-dioxide emissions per energy produced from incinerators are more significant than coal-fired power plants. 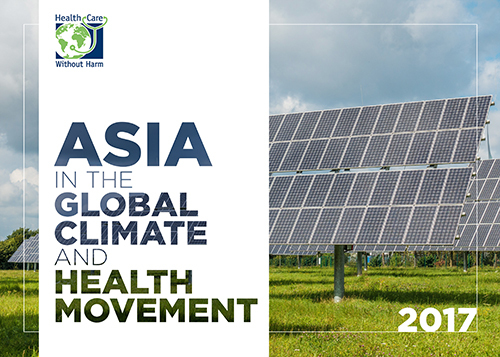 HCWH-Asia, together with EcoWaste and GAIA, urged the local government units not to be wooed by coated promises of corporations peddling dirty technologies, and for the public to remain vigilant against the spread of these toxin-producing machines. Incinerating waste can release carcinogens and some of the most toxic man-made compounds into the air, including neuro-toxic heavy metals like mercury, lead, cadmium, and arsenic. The gathering opened minds to environmentally sound waste management alternatives like waste segregation, re-use, recycling and composting. The groups also presented success stories about hospitals that have successfully managed their waste without burning. 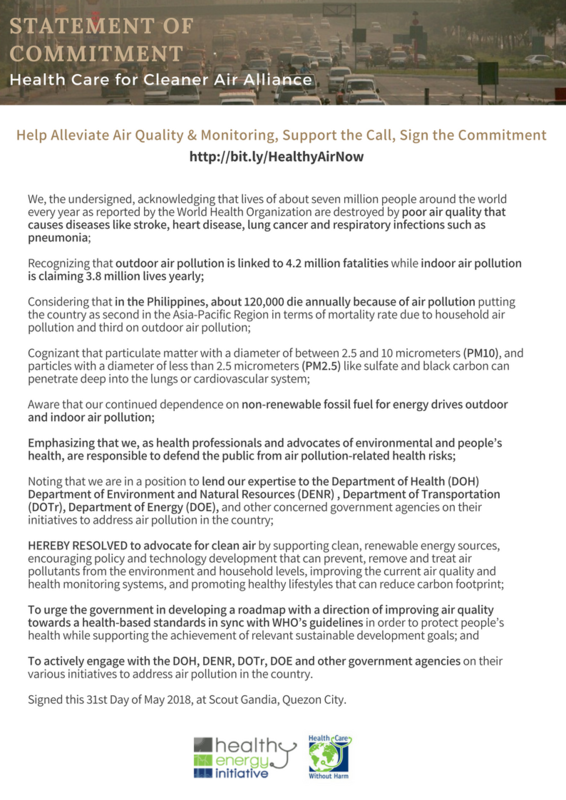 In 2012, HCWH-Asia, along with other environmentalists and health care advocates, called on the Philippine Department of Health to remove the inclusion of pyrolysis in the revised Health Care Waste Management Manual as an option for dealing with medical wastes stressing that the said provision violates the spirit and intent of the Clean Air Act of 1999. The Health Care Waste Management Manual was revised as part of the Global Healthcare Waste Project of the United Nations Development Programme-Global Environment Facility (UNDP-GEF), HCWH and World Health Organization. The project’s primary goal is to protect public health and the global environment from the impacts of dioxin and mercury releases. The issues of incineration and open burning of health care waste and non-segregation of infectious medical waste precipitated the need for the project. Another issue raised against the Manual is the replacement of the word “reduce” with “recover” in the 3Rs of waste management. Such replacement will downplay waste minimization in favor of amassing a certain volume of waste (recovery) in order to produce energy or fuel. To date, the Philippine DOH has not responded to the group’s call. While calling for the cancellation of the incinerator loan, HCWH-Asia proposes the redirection of debt payments to fund the improvement of local health services instead. These efforts are being made in partnership with concerned groups, and are aligned with the country’s Millennium Development Goals. In recognition of the campaign, the Philippine congress withheld interest payments for the incinerator loan in the 2008 national budget. Furthermore, it appropriated an additional Php 100 million (about US$2 million) for the DOH to purchase autoclaves for the disinfection of medical waste. This was however instead used for the purchase of mercury-free thermometers and sphygmomanometer. The Buddhist Dalin Tzu General Hospital in Taiwan is among the many health care facilities who are gearing towards a greener and healthier practice. But what makes it standout is the strong volunteerism practice that involves not just the health care workers but even members of the community. 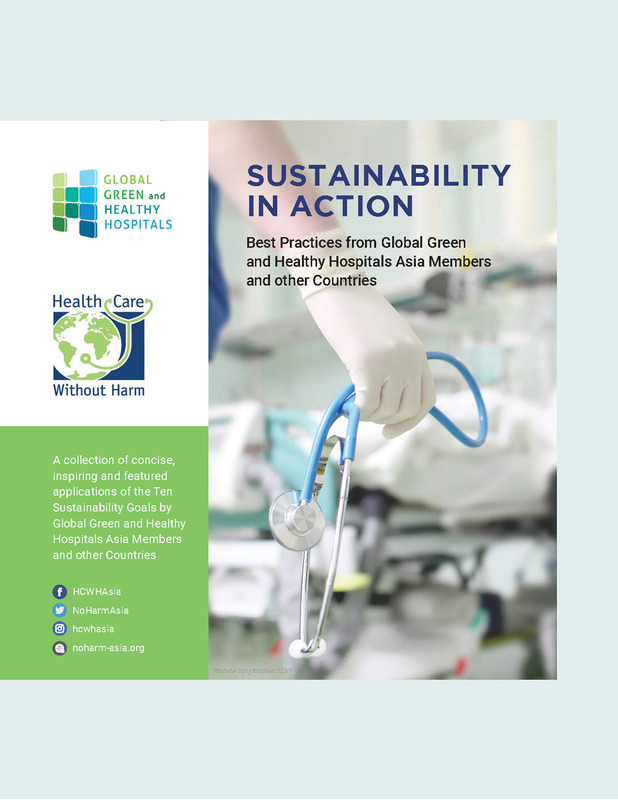 Three years in a row of distinguished awards for environmental protection is coupled with a significant decrease in the amount of waste generated per hospital bed per day and an increase in the total weight of recycled material. The strategy: 3Rs: reduce from the source, re-use innovatively and recycle and 2Es: education and encouragement and making the practice a way of living. 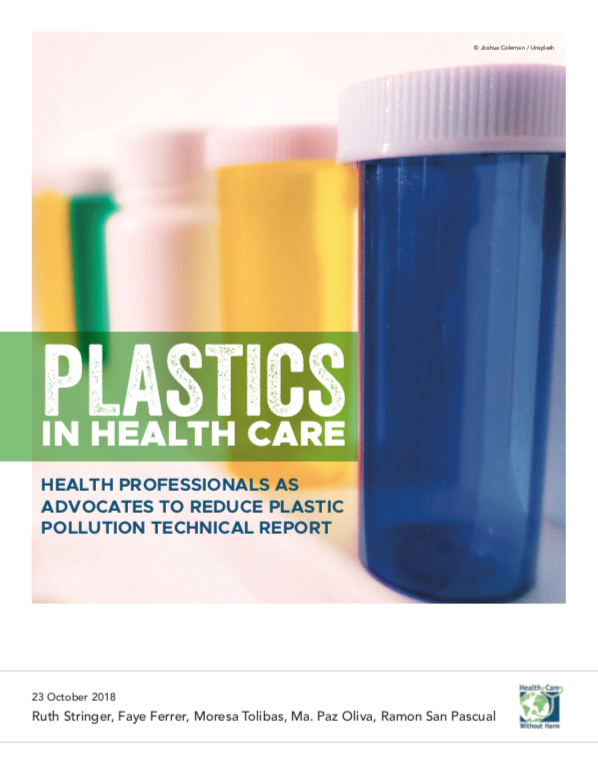 Among the measures done by the hospital are utilizing modern information technology shunning away from paper and films, refraining from disposable items and mandating use of reusable items when feasible, recycling in the whole hospital campus, education for staff, hospital contractors, patients and family and community and a pledge for environmental protection from the management level.